We note that Martin Harvey - UKIP Branch Chairman, former PPC, former NEC candidate and Farage critic - has been removed as chairman of the Harlow branch in the Eastern Region. The meeting to remove him was held last weekend. Mr Harvey has been a stern critic of UKIP's corrupt leadership for many years. 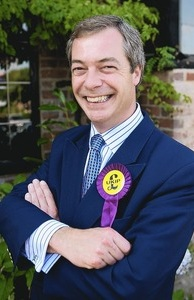 His recent criticism of the proposed constitutional changes was seen by UKIP's leadership as the final straw. He was also accused - without proof - of supplying information to GLW and this blog. We note that the odious Peter Reeve and the regional chairman (Reeve's lackey) attended the meeting to 'advise' members to vote against Mr Harvey in the 'interests' of the party. Interesting article on Steve Allison and his new 'party'! 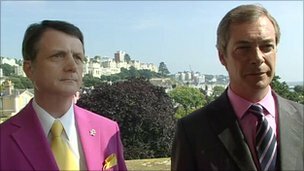 THE chairman of UKIP’s Hartlepool branch said claims the formation of a new political party is an attempt to get their councillors elected by the back door are “nonsense”. Hartlepool Independents – Putting Hartlepool First was accused of trying to deceive voters in an email circulated to all councillors earlier this week. Party members denied the accusations and Eric Wilson, chairman of the UKIP Hartlepool branch, has also slammed the claims. Mr Wilson said: “The suggestion that the formation of Hartlepool Independents is an attempt by UKIP to get councillors elected by the back door is nonsense. It comes after an email from former UKIP councillor and Hartlepool Independents secretary Stephen Allison, dating back to last July, was leaked by former UKIP member Stephen Haddow. 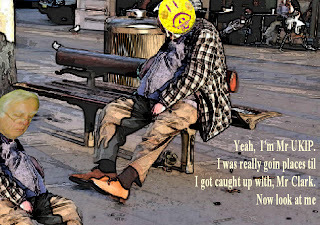 Mr Haddow said Hartlepool Independents – Putting Hartlepool First was deliberately created and registered in a bid to elect UKIP councillors by the back door. At the time Mr Allison was vice chairman of UKIP and a member of the party’s national executive committee. But he severed all links with UKIP last November. The email was a report of an NEC meeting which featured talks about “dual candidates”, something Mr Allison said he was pushing for at the time. In the email, Mr Allison said: “If, for example, an organisation called Hartlepool Independents or Hartlepool Residents was registered with the Electoral Commission, UKIP could reach an agreement to field joint candidates. Mr Wilson said: “I question Mr Haddow’s motives for leaking the email weeks before important local elections. It’s a pathetic attempt to discredit UKIP and Hartlepool Independents. Mr Wilson said UKIP intended to put forward candidates in all 11 wards for the all-out local elections in May in which the number of councillors will be cut from 47 to 33 and the number of wards reduced from 17 to 11. The party is registered with the Electoral Commission as Hartlepool Independents – Putting Hartlepool First. 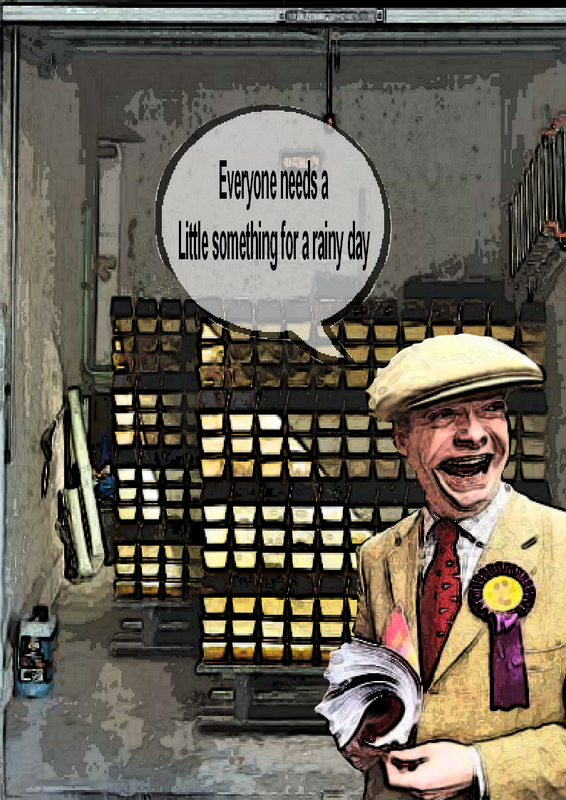 UKIP: Kent newspaper asks Nigel Farage is he value for money? He declines to answer! 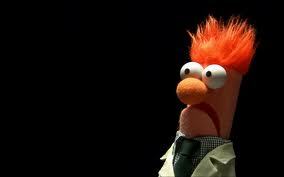 Nigel Farage. On the EU Gravy Train and loving it! It is intersting to note that This is Kent conducted a survey to see how many people recognised their MEP. Only three in a hundred could name Farage! We hear that Nigel was most upset upset upon hearing this revelation. So much for all those appearances on Question Time and the Daily Politics! The Kent and Sussex Courier also contacted Farage and asked if he was value for money. He declined to answer. Says it all, really! Are our MEPs worth £157k? THEY were mistaken for Arthur Scargill, Richard Attenborough and Gillian McKeith, the peculiar woman from TV programme You Are What You Eat who made her name by analysing human waste. Sadly, the truth was far less interesting. The Courier took to the streets of Tunbridge Wells last week to conduct a survey of 100 people to see whether they could identify their ten Members of European Parliament. Only one person spotted Tory MEP and Daily Telegraph columnist Daniel Hannan. Three others managed to guess UKIP's leader Nigel Farage. But for the remaining 96 per cent of respondents, the closest they could get was a quizzical "are they councillors?" For many, the European Union remains a mysterious monolith and, if our survey is anything to go by, its players are as obscure as ever. Yet the basic salary for an MEP of e95,484 (£79,400) is considerably more than the basic salary of an MP in the House of Commons. They earn £65,700. This is before the e303 they get for every day they attend the European Parliament – an average of 142 times a year for our MEPs. They also take sizeable chunks of money to fund their offices and pay staff salaries. Three of them – Richard Ashworth, Nirj Deva and Nigel Farage – admit to employing members of their own families. It begs the question: what exactly do they do? The Courier contacted all the South East's MEPs to ask precisely that. The spokesman for Lib Dem Sharon Bowles described her role as "very extensive", claiming she takes just two weeks' holiday a year and works seven days a week. He added: "She represents the residents of South East England in Parliament and answers their queries and helps them with problems that have some European aspect to them." Mrs Bowles' Lib Dem colleague Catherine Bearder described herself as a "staunch supporter" of the EU, representing more than eight million people in an area stretching from Oxford down to East Sussex and Kent. London is not included. She said: "I ensure environmental protection is at the heart of European policy, campaign on social justice issues – significantly human trafficking – and push the huge benefits of an economic union." Keith Taylor is the region's only representative from the Green Party. He explained while the Greens accepted that the EU needed to become more democratic and accountable, some decisions had to be made at a European level. "Most of our environmental legislation comes from the EU and there's also EU legislation to protect consumer rights, animal welfare, human rights, health and people's working conditions," he said. Labour's Peter Skinner said it was his job to represent the interests of his constituents. He added: "A lot of work needs to be done to make people feel connected to what happens in Europe and why it's relevant to their day-to-day lives. "However, as the single biggest market in the world, it is crucial to our exports and supports millions of jobs." Tory spokesman John Furbisher said they had led the way in openness and transparency, volunteering to publish their allowances online. "Our expenses and staffing costs reflect the fact we are obliged to work and run offices in three countries: Britain, Belgium and France," he added. "Legislation passed in Brussels and Strasbourg has enormous impact on life and prosperity in Britain – and we are elected to bring a British Conservative influence to bear on that law-making and to represent our constituents." Since the Lisbon Treaty, the European Parliament has increased its powers and now shares legislation implementation with the 27 EU commissioners and the Council of the European Union, which comprises ministers from each home nation's parliament. But are they really worth all the money they are paid? For the most part our MEPs evaded the question, except for Mrs Bearder who said: "Based on my workload, I feel the British taxpayer certainly gets value for money out of me as an MEP. An excellent article that exposes the hypocrisy of Nigel Farage. His claim to have lost his receipts is a truly pathetic excuse. And he's fooling no-one. So what about all the other times he failed to publish his allowances? Did he 'lose' the receipts for those? He clearly has much to hide! Farage has the nerve to condemn the EU but is more than happy to 'employ' his wife using EU money. So what does she do for the £25,000 plus? No-one knows for Farage refuses to provide details. 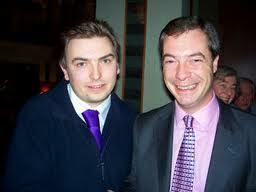 And yet he has the cheek in the article to claim that he is not 'feathering' the Farage nest by employing her! So why is he employing her? Did he ever advertise the job that she is supposedly doing? The answer is no. And let us not forget that this EU money is British taxpayers money. MEPs do not have to publish allowance details by European law, but the region's nine other MEPs have chosen to do so. 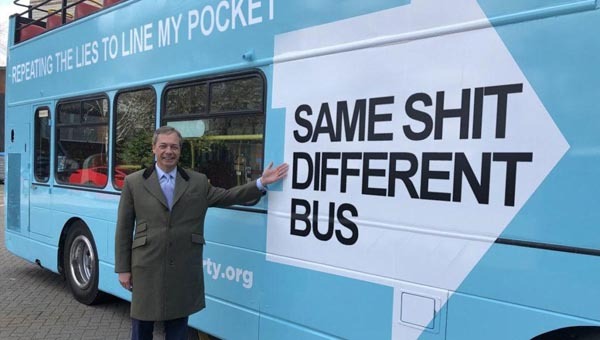 In a statement from Mr Farage's office, a spokesman said the details had not been put online because the receipts had been "lost somewhere in transportation" between Mr Farage and his accountant. Mr Farage, who employs wife Kirsten on a salary of more than £25,000, funded by the taxpayer, insisted there was "no feathering of nests". Stridently anti-EU in his views, Mr Farage said: "Nothing about the EU gives value for money to Britain. 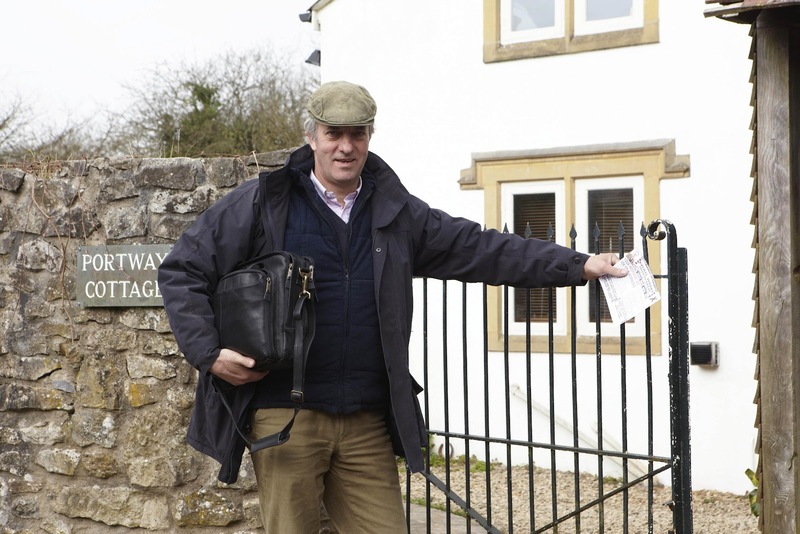 "I may be paid more than an MP but my constituency is bigger than many countries in the EU and there is no 'feathering of nests' in the Farage household, I can assure you." John Agnew - or Stuart as he likes to be known - is not the brightest of sparks. He is a self-appointed expert on matters of which he knows nothing, but it is on the subject of climate change where he really provides the best entertainment. According to his blog, there is no such thing as global warming because it was a bit chilly on his farm last weekend. He writes "According to the last figures I heard, we had not actually warmed at all in the 2000s!" Where he heard that we can only speculate. Perhaps he was briefed on the subject by that other buffoon and wannabe Lord, Mad Monckton, UKIP's resident loony. Average temperatures for the period 2001-2010 were 0.20°C above those of 1991-2000. Not a particularly startling statistic, but one that exposes Agnew's stupidity for what it is. By extension, Agnew could argue that are no such things as tidal waves, because his farm was not hit by one last Tuesday. But that really is the level of intellect in Farage's UKIP. And people wonder why the party is not taken seriously. David Bannerman campaigns for the Tories in London. Someone please warn Boris! We wonder how the OLAF investigation is progressing? Will David tell us? You can contact David on 01954 210333 or 07796 225237. Email: office@dcbmep.org. 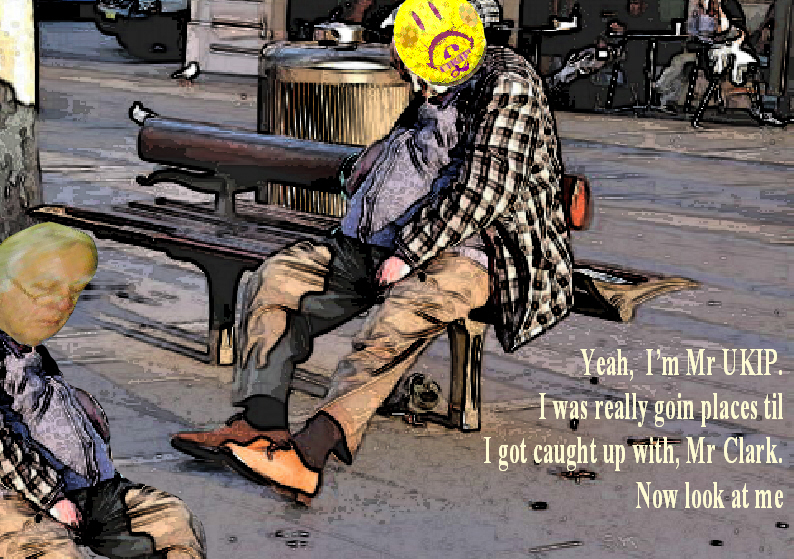 We note that Roger Helmer has sent out a begging letter to UKIPPERS. So how much does Mr Helmer intend to contribute to UKIP funds? Nigel Farage still plans to turn UKIP pan-European. And why? To get more money for himself and his cronies! Consider the above photo. UKIP are already putting out posters which link them with the pan-European EAF! Prof Congdon foolishly falls for Farage's lies that he will not take UKIP into a pan-European party. He is persuaded to back the Yes vote for the new UKIP constitution. And now he's singing the praises of two of the most incompetent and corrupt members of UKIP! Why are some intellectuals so naive? We are reminded of those UK academics who travelled to Stalin's Soviet Union in the 30's. They came away singing his praises after being assured by his sycophants that 'Uncle Joe' was a nice guy and all those stories about millions being murdered were just fascist spin. One can only assume that the Professor has been the victim of a very nasty blow to the head. Only such an accident can explain these laughable quotes from one of his recent emails! "We are fortunate to have as our guest speakers UKIP’s two most successful campaigners in local elections, Cllr. Lisa Duffy and Cllr. Peter Reeve. " "The Forest of Dean branch is exceptionally lucky to have Lisa and Peter to tell us how to organize local election campaigning ahead of an important electoral test. I am sure attendees will pick up lots of tips and ideas for their own local election battles." We would strongly advise the Professor to do a little bit of research on these chumps before making any similar statements in the future. It may prevent him looking even more foolish! Ramsey Town Council (of which Duffy is Mayor and Reeve a Councillor) has the same powers as a parish council. Nothing more, nothing less. To present this a massive victory for UKIP is absurd! Candidates were always non-political. But then along came Reeve and Duffy. We can confirm via our contacts in Ramsey that recent events have left a very sour taste in the town with allegations of 'dirty tricks' on the part of Reeve and his munchkins. Reeve posted numerous election posters across the town WITHOUT getting permission from the local authorities. Complaints were made to the returning officer and they were removed. However, within a few days they had mysteriously reappeared. Reeve, of course, claimed to know nothing about this. Reeve also distributed election literature which failed to comply with electoral law. For instance, official UKIP leaflets and letters failed to mention who had promoted or printed the literature. They are allegations that UKIP's election expenditure far exceeded the amount allowed by law. The Lib Dems did not contest the election and the Tories failed to distribute election literature or even conduct a basic campaign. UKIP was given a easy ride. Three of UKIP's councillors don't even live in Ramsey. Reeve at the very first council meeting had the UKIP councillors appoint Lisa Duffy, his girlfriend, mayor. He also instructed them to appoint Ian Curtis, his friend, deputy mayor. He then told the non-UKIP councillors - he used the words 'you lot' - to sit on the other side of the table as 'his councillors' did not wish to sit with them. This arrogant, combative stance has angered many in the town. Reeve and Duffy are VERY ambitious people. They ultimate goal is sit alongside Farage in Brussels. Reeve, on his first visit to Brussels, was heard to to say: I'd love to work here! Reeve also thinks that one day he will become UKIP's first elected MP. He has even promised to marry Duffy in Westminster once elected as a Cambridgeshire MP. She's got a long wait! They are using the people of Ramsey for their own sordid ends. Greed is the sole thing that motivates this dishonest pair! Delusions of grandeur has always formed a large part of the psyche of this unsavoury duo! Let's just hope that the Town's officials are good at damage limitation! We have been amused by the amount of UKIP supporters on Twitter, Facebook and the blogs who seem to think that winning a majority (in crude fashion) on a non-political council is a cause for celebration. But for people like her UKIP would have been cleaned up years ago. But that is why she was promoted to Director of UKIP - a very well-paid position!. 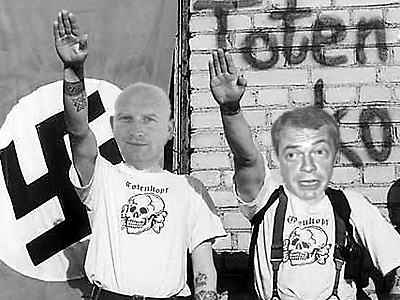 Nigel ALWAYS supports his sycophants in their time of need! But we have no doubt that some misguided fools out there will actually think that she is an asset to UKIP. End of statement. Spelling and grammar as the original. 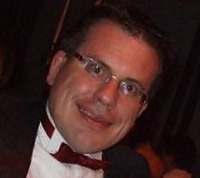 Duffy - also known as Scruffy Duffy - promised Farage hundreds of new YI members by the end of 2008. She failed to keep her promise. The YI five-a-side football matches also failed to materialise. The YI newsletter - supposedly a regular publication- appeared with as much frequency as Halley’s Comet. The YI website was about as informative as listening to David Bannerman’s maiden speech as an MEP. She ignores emails and requests for help from members. And not let us forget her role in spreading lies about Gregg Beaman. One of life's ironies is that it was only in May 2008, at the North West Spring Conference in Morecambe, that Rachel Oxley and Lisa Duffy had complained to me that Annabelle Fuller had spent the Saturday evening texting Nigel Farage, quite suggestively and quite openly, about what she wanted to do with him when he came to the North West the following day. Lacking the courage of their convictions they happily passed it on to me. But later Duffy was terrified that the Party Chairman was upset with her for 'spilling the beans' on the Leader. And that was after them specifically asking me to pass on their concerns to the Party Chairman. And don't forget how she enthusiastically supported the expulsion of David Abbott, Martin Haslam and Eric Edmond from UKIP's NEC. And why was Dr Edmond branded vile? Because he wanted UKIP to be open and democratic. Because he committed the unforgivable sin of actually wanting to tackle the widespread corruption within the party. Because he wanted to deal with complaints and not sweep them under the carpet. It is not Dr Edmond who is vile. It is Lisa Duffy and her kind who best fit that particular description. There are serious concerns regarding the outcome of the vote to change UKIP's constitution, a change that now gives Nigel Farage - via control of the NEC - the final say on who becomes an MEP candidate. We remind our readers that it also gives Nigel Farage the final say on UKIP becoming a pan-European party (see below). UKIP's leadership claim that 91.9% (6745) voted Yes. They also claim that only 593 (8.1% ) voted No. The last person to get such a massive percentage of yes votes was a certain Adolf Hitler in 1930's Germany! And that was always over 90%! How apt that Farage now claims a similar dubious result! Members of the Junius Team have contacted UKIPPERS across the UK and have yet to find a single member who voted Yes. The whole thing frankly stinks. So what of the allegations that voting slips from deceased members were received? What of the allegations that No slips mysteriously vanished? And what of the allegations that extra Yes slips were copied and later added to the Yes pile during the count? 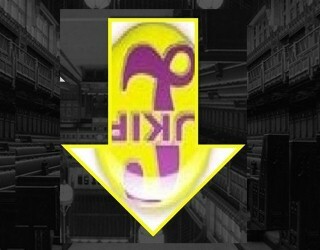 So the last flickers of democracy in UKIP have been extinguished following a highly dubious vote. Hail the Fuhrer! 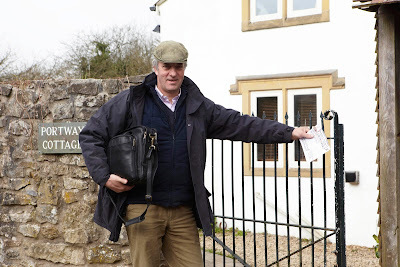 Tim Congdon dropped his opposition to UKIP's constitutional changes because Nigel Farage promised him that UKIP would not be taken into a pan-European party during his leadership. Our photo (taken in October 2011) shows that this was a lie. 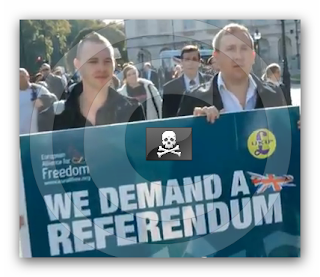 The placard has the UKIP logo alongside the EAF (a pan-European party) logo. This EAF sponsored placard is being held aloft by UKIP activists who are clearly wearing UKIP rosettes. Thanks to Farage, the EAF name and logo are now out on the streets of Westminster, being held high by UKIP members and activists. One of our contacts has told us that yet another UKIP branch in Lincolnshire has folded due to a collapse in membership and an unwillingness on the part of the few members left to take on the chairmanship. And so the East Midlands continues it's slow death under the corrupt and incompetent Derek Clark MEP. 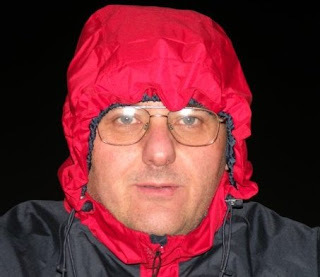 Resigned member of UKIP and ongoing supporter. "We seek an amicable divorce from the European Union and its replacement with a genuine free-trade agreement, which is what we thought we’d signed up for in the first place." Has he therefore, given his style and temperament, decided to enjoy the EU gravy train while he is able? Is this not also supported by the fact that Nigel Farage was founder and co president of the EFD, for the extra money it gave UKIP, despite as a Group being pro EU membership and containing some extreme racists and anti homosexuals. There are so many reasons which bar UKIP from making a break through at Westminster it is difficult to know where to start. However just consider one of many examples of the muddle at the heart of UKIP. We have already written about the planned move to remove Derek 'I luv a piece of Cod' Clark as Regional Chairman. He was to face a vote of no confidence, a vote that he was not going to win. We can confirm that the East Midlands Regional Committee has been dissolved. This was proposed by Charles Swaby, a proposal that allowed Clark to stand down and thus prevent the humiliation of being removed by his fellow UKIPPERS.